The 16-bit generation was something of a golden age in gaming. After years of perfecting the craft, developers seemed to have finally reached a level of quality in game design so good, that only in recent years is it being replicated in consistency. However, even golden ages have their dark days. Even with the level of quality to be found in the 16-bit generation, a few stinkers still found their way. Among the worst of them is Wayne’s World, based on the popular comedy from the early 90s, which in turn was based on a Saturday Night Live sketch. To be fair, Wayne’s World is at the very least playable… In the sense that it isn’t flat-out broken like Wizard of Oz on SNES or Dark Castle on Sega Genesis. Nor does it have a control scheme as utterly dumbfounding as Batman Forever on SNES. What places Wayne’s World in that same ballpark, however, is its sheer uninspired presentation, and its utter ineptitude in execution. The game is basically a 2D platformer, where you play as Wayne Cambell, trying to save his buddy Garth. 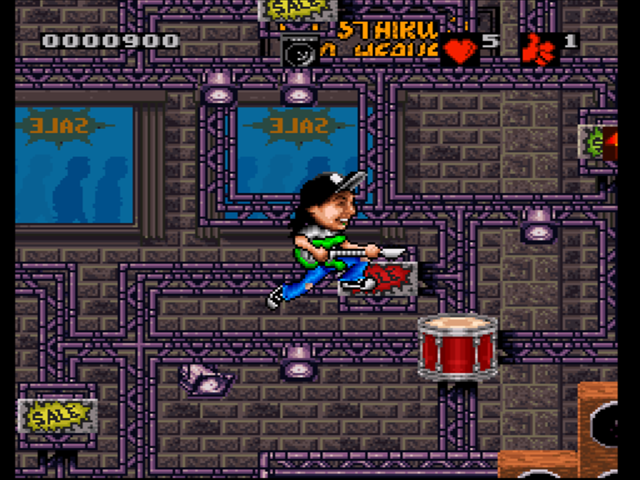 It’s very basic stuff, with Wayne running, jumping, and shooting shock waves out of his guitar to fight enemies. The first thing you’re bound to notice is how ugly the game is. Wayne has a huge bobble head, and the level design is generic aesthetically, and a complete mess in terms of design. The first stage alone is a baffling labyrinth of loud speakers and electric barriers that hurt you when touched. The levels feel like they recycle the same few elements and traps over and over, making it confusing as to whether or not you’re progressing or just going through the same areas over and over again. To make things worse, the platforms are all cramped close together, so often times when you’re trying to jump over a trap, you’ll jump back to an earlier part of the stage. It’s some of the sloppiest, most confusing level design you’ll find in a video game. I would go on and on about how terrible the game is, but really, there’s nothing else to it. It really was just a cheap, thrown-together cash-in made to capitalize off the popularity of the movie (which is actually decently funny for a 90s comedy). Wayne’s World is just painfully uninspired gameplay mixed with atrocious level design, topped off with ugly visuals and irritating sounds. I was just playing this the other day, hilarious! Awesome! You’ve got my follow. Check out my comedy blog and give it a follow if you like it!